rom harvesting energy to power plants, the use of power electronics is everywhere and there isn't an application that doesn't require power. The power electronics industry is very dynamic and many new technologies have made the impossible, now possible. In the unceasing quest to increase performance levels, reliability and sustainability, new components and technologies such as Wide Bandgap Semiconductors and Digital power management are getting a lot of attention and coverage. However, hiding in the shadows there is a component that is very important and intrinsically involved in many vital applications; The Supercapacitor. In the part 1 of this article we reviewed the origins of the supercapacitors, how they work and the amazing potential, someday, to supersede batteries, but will that happen? 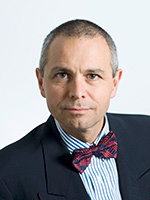 Following Elon Musk's speech at Cleantech Forum 2011, there has been a lot of interest in supercapacitors. The potential offered by nanotechnologies is keeping hopes high that at some point in the future supercapacitors might reach a point where they equal the performance of batteries. 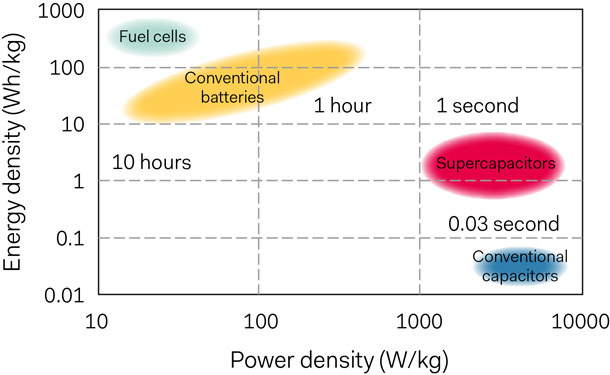 As can be seen in Figure 01, energy vs power density for different types of energy-storage devices, at the present time the performance levels of fuel-cells, batteries, ultracapacitors and conventional capacitors do not overlap. However, they are complimentary, and recent technological advancements are reducing the gap between batteries and supercapacitors. Each of those technologies has their advantages and disadvantages that power designers take into consideration when developing power systems. 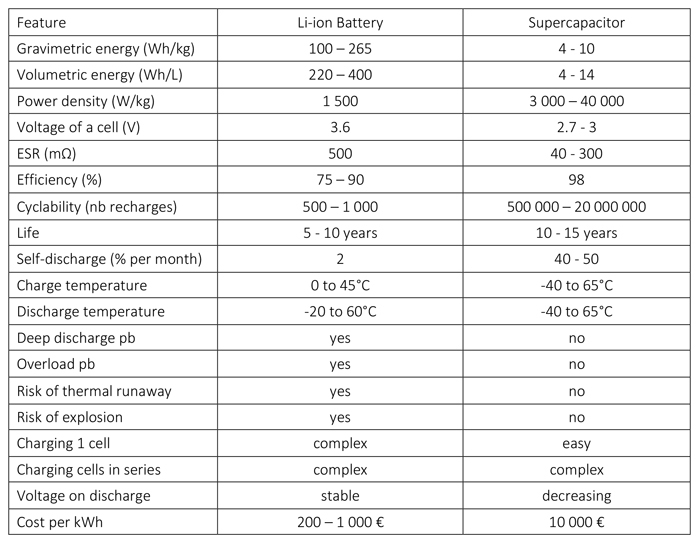 In Figure 02 we compare the key parameters of Li-ion batteries and supercapacitors, and it is obvious that one of the key benefits of the supercapacitor is its extremely high cyclability. It can be charged and discharged virtually an unlimited number of times, which is unlikely ever to be the case for the electrochemical battery which has a defined, much shorter life cycle. Ageing is also in favor of supercapacitors. Under normal conditions, from an original 100% capacity they only lose 20% in 10 years, which far exceeds the levels achieved by any battery. For systems designers working to power systems in harsh environments, supercapacitors will operate in very low to high temperatures without degradation, which we know is not the case for batteries. On the downside supercapacitors discharge from 100 to 50 percent in 30 to 40 days, whereas lead and lithium-based batteries self-discharge about 5 percent during the same period; but technology is improving daily and supercapacitors are becoming better and better. With the growing demand for renewable energy and issues relating to energy storage, there is a rising question about the reasoning behind building huge banks of Lithium Ion batteries. We all know that these batteries have a limited lifetime, and there's the associated environmental risks since as well as consuming precious raw materials they're not easy to recycle. This is where research is very interesting and the disclosure presented by the Universities of Surrey and Bristol in February 2018 on the development of polymer materials is appealing. They achieved practical capacitance values of up to 4F/cm2 when the industry standard is 0.3F/cm2, and they are expecting to reach 11-20F/cm2 in the near future. When such levels of capacity are achieved we will be able to talk about 180Wh/kg, which is similar to lithium ion batteries. The level of research in supercapacitors is really impressive and the gap is closing. How fast that will happen remains unknown, but considering the number of patents filed, papers presented and levels industry interest, it shouldn't take too long. Supercapacitors are almost everywhere, from the Shanghai bus experiment to run a fleet of buses powered only by supercapacitors to smart meters and harvesting energy, it is almost impossible to draw up an exhaustive list of applications. For sure it is their ability to sustain high charge and discharge cycles that makes them ideal for private and public electrical vehicles and machinery such as port-cranes to accumulate and re-use energy. But in many applications, when designers need peak power, they are there. If you are an audiophile, your audio amplifier might contain a supercapacitor bank able to deliver kilowatts of peak power to your bass loudspeaker when Ferruccio Furlanetto bellows out the deep notes in Don Quichotte. If you have a smart meter at home, it most probably contains a supercapacitor able to deliver peak power when transmitting stored data via the GPRS module. And again, if you are a technology geek following the Lamborghini 'Terzo Millennio' project, you will have noticed how important a role supercapacitors play in the motorization of this very special, electric powered sport car. Safety is another benefit of supercapacitors and that is the reason why they are the first choice when backup or peak power is required in a restricted environment. Critical applications operating in hostile or confined environments are strictly regulated in terms of chemical and other hazardous risks, reducing or forbidding certain type of batteries such as Lithium Ion. For safety reasons, those applications must have a power backup long enough to run alarms and safety shutdown processes. In such arduous conditions, conventional batteries are replaced by supercapacitor banks whose values could be from a few Farads to 200 Farads for general applications (Figure 03). As we have seen, supercapacitor technology is moving extremely fast. The challenges posed by the energy storage issue is the most likely area where we will see the more immediate benefits of nanotechnologies being implemented in supercapacitors. One example to close this article is the very interesting research conducted by the University of Central Florida on combining distribution cable with the capacity of supercapacitors. Assistant professor Jayan Thomas of the NanoScience Technology Center has found a way to improve a regular copper wire to transform it into a supercapacitor cable. Based on nanowhisker technology it could transform the standard copper wire into a supercapacitor capable of storing and delivering large amounts of power. So in some degree of silence supercapacitors are becoming the most promising component for the future. Many power designers are already implementing power solutions based on supercapacitors but considering how fast research takes place and the huge challenges that humanity faces due to climate change, one day in the not too distant future, supercapacitors will be the heart of modern power solutions.